Home » VectorVest » Buy Midwich Group (MIDW) says VectorVest. Another quality ‘under the radar’ growth company. Buy Midwich Group (MIDW) says VectorVest. Another quality ‘under the radar’ growth company. By Alan Green in VectorVest on 5th September 2017 . UK-based Midwich Group (MIDW.L) is a provider of audiovisual (AV) and document solutions distributor to the trade market at home, Ireland, France, Germany and Australasia. MIDW has a product portfolio across audiovisual categories, such as large format displays, projectors, digital signage and printers, selling to a base of approximately 10,000 customers, most of which are professional AV integrators and IT resellers serving sectors, such as corporate, education, retail, residential and hospitality. 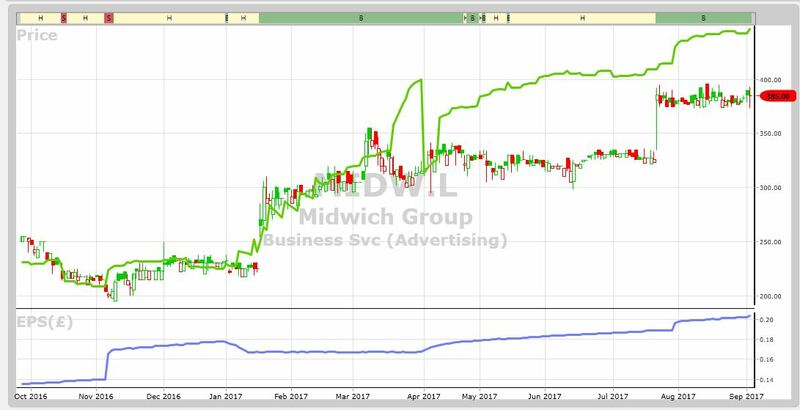 On July 21 2017, MIDW published a pre-close trading update for the six months ended 30 June 2017. The group said it had traded well during the period, seeing good top line growth across all of its geographies on a constant currency basis helped further by the continued weakness of GBP. In addition, this underlying revenue growth was delivered whilst maintaining overall gross margins in line with those reported for 2016. MIDW also reported that the new Spanish business, Earpro, acquired in March 2017, has had a very positive start contributing ahead of previous expectations in its first three months. As a result of this strong H1 performance and on the basis of current indications of positive H2 sales momentum, MIDW anticipates reporting results for the full year comfortably ahead of its previous expectations. Half-year results for the period will be announced on 12 September 2017. The latent strength in MIDW and the strength in the balance sheet had been identified by VectorVest as far back as the September interims a year ago. Despite the impressive growth in value and share price since then, the VectorVest GRT (Earnings Growth Rate) recorded today, (reflects a company’s one to three year forecasted earnings growth rate in percent per year), shows a forecasted GRT for MIDW of 28.00%, which VectorVest considers to be excellent. In addition, the VST – the VST-Vector master indicator for ranking every stock in the VectorVest database, logs MIDW at 1.27, which is very good on a scale of 0.00 to 2.00. From a valuation standpoint, VectorVest logs a current rating of 446p per share, indicating MIDW is still undervalued at its current 385p. The chart of MIDW.L is shown above using my normal notation. Earnings per share (EPS) is growing strongly and this is the engine that is driving the share price. Recently the share jumped strongly (on the day of the trading update) and for the past month has refused to come back and kiss the last old high made in March earlier this year. This is the definition of a strongly bullish trend as discussed in the works of Charles Dow over 100 years ago. Summary: Regular readers of my articles will by now be fully aware of how effective the VectorVest stock analysis system is at identifying quality ‘under the radar’ growth companies. 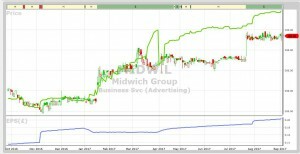 MIDW is the latest in a long line, and with the RT (Relative Timing) indicator signalling a rating of 1.25, (very good on a scale of 0.00 to 2.00), in the run up to the half year results announcement next week, adventurous investors will be betting on further contributions from the recent Earpro acquisition despite MIDW trading at year highs. The 2.2% yield further underlines the attractive investment opportunity offered by MIDW. VectorVest rates the stock as a buy. Readers can examine trading opportunities on MIDW and a host of other similar stocks for a single payment of £5.95. This gives access to the VectorVest Risk Free 5-week trial, where members enjoy unlimited access to VectorVest UK & U.S., plus VectorVest University for on-demand strategies and training. Link here to view.